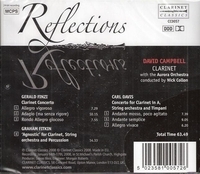 “David Campbell is a British clarinetist who is internationally recognised as one of Britain's finest musicians and was described by the doyen of British clarinettists, Jack Brymer, as 'the finest player of his generation'. A large part of Campbell's early career was spent as a clarinetist in the field of contemporary music as a member of Sir Peter Maxwell Davies' chamber ensemble, 'The Fires of London' also playing regularly with the London Sinfonietta, Endymion, and Lontano, but over the past twenty years David Campbell has developed the solo and chamber music strands of his career, performing in over forty countries with leading orchestras and ensembles. His repertoire is wide-ranging but he still champions new works, many of which have been written for him. The most recent were a new concerto 'River of Crystal Light' by Peter Lieuwen, which he played and recorded in the Texas Festival in June 2005 and a clarinet quintet, 'The Sun and the Moon' by Michael Stimpson which received its premiere in Aberystwyth with the RTÉ Vanbrugh Quartet in July 2005. In February 2006 David played concerti by Mozart and Charles Fitts (World Premiere) in the USA with the Houston Chamber Orchestra. As well as numerous broadcasts over the past thirty years, David has made many CDs including two versions of the Mozart Clarinet Concerto with the City of London Sinfonia and Royal Philharmonic Orchestra, two versions of the Brahms Clarinet Sonatas as well as the Mozart and Brahms Quintets, Messiaen ’Quartet for the End of Time’, two albums of music by Charles Camilleri, the Bliss Clarinet Quintet, Philip Cannon's Quintet, Logos and works by Martinu, Maxwell Davies and Carey Blyton. His recording of Peter Lieuwen's 'River of Crystal Light' was released in May 2007 and future projects include recording a third CD of works by Charles Camilleri and an album of English clarinet quintets, and concerti by Carl Davis, Gerald Finzi and Graham Fitkin in Estonia with the Tallinn Chamber Orchestra.